Most people have a few pinchable places they’d love to lose a little fat. But one of the places where most of us don’t want to lose it is in the face, where it gives the features an attractive, youthful, rounded appearance. Without fat, the face develops hollows under the eyes and in the cheeks, the lips grow thin, and the round features become angular, harsh. Above all, they begin to look old. Fortunately, Juvéderm can restore lost volume so that whether your face is too thin because of illness, age, or exercise it can look young again. Want to learn about the benefits of Juvéderm or BOTOX ® Cosmetic in Hilton Head? Please call (843) 706-2999 for email Beyond Exceptional Dentistry today for an appointment. In addition, Juvéderm is a great treatment for adding lost volume to fingers and hands. Many people have learned the trick of judging age by hands, so it’s a great way to throw them off. Where Did Your Face Lose Volume? Sometimes volume lost isn’t due to a loss of fat—you might have lost volume in your teeth. Our teeth are part of the support and structure for the face. If they get worn down, or lost, the face loses volume. When this happens, it can contribute to the natural motion of fat pads that are responding to gravity. As these fat pads slip, they turn into jowls and leave hollows behind. A nonsurgical facelift can help restore your teeth to their prior shape and help restore your face, too. 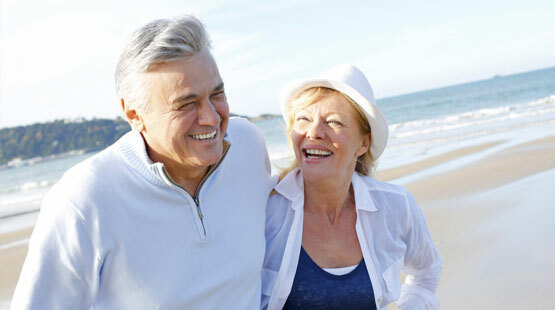 Even if you’ve lost all your teeth, you can still look younger with FOY Dentures®. Juvéderm is made from hyaluronic acid, which might sound artificial, but it’s not. It’s a compound that occurs naturally in your skin, joints, eyes, and elsewhere in the body. It’s a natural moisturizer, but that’s not what makes it a good choice for restoring volume. Hyaluronic acid has the power to attract and bind water molecules, helping the molecules to maintain their volume. As your body naturally starts removing hyaluronic acid from the injection site, it draws more water, so it doesn’t shrink. Instead, it maintains its volume a lot longer, about 3-6 months or more, depending on where the injections are. Juvéderm also has the benefit of being a smooth gel, which makes it ideal for use in places where the skin is very thin, such as the lips. If you want to find out whether Juvéderm in Hilton Head can help you achieve a younger appearance, please call (843) 706-2999 or contact Beyond Exceptional Dentistry.